Is your blood pressure still high despite taking medications? Are you under constant stress and your blood pressure has started to rise? About one in three Americans suffer from high blood pressure (hypertension). High blood pressure is sometimes called the “silent killer” since it often does not present any symptoms. Prolonged hypertension can lead to heart disease, kidney failure, stroke and even blindness. Fortunately, high blood pressure is easily detectable and responds well to natural supplements, which are safe and without any side effects. 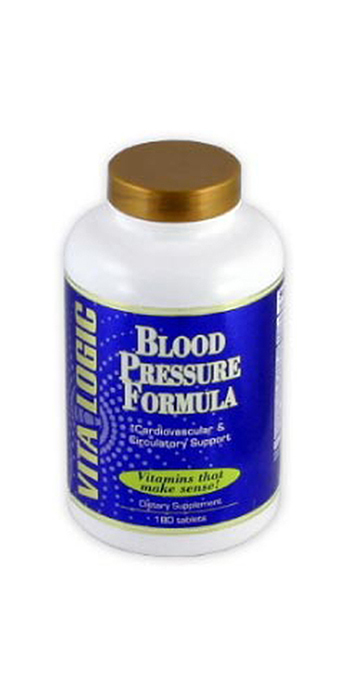 Blood Pressure Formula by Vitalogic Vitamins is a scientifically formulated supplement for high blood pressure packed with natural ingredients that have been proven to have a positive effect on blood pressure, circulation and cardiovascular health. Hawthorn (Crataegus oxyacantha) berry extract has long been used as a cardiovascular tonic. Hawthorn’s effect on blood pressure is thought to work by increasing blood supply to the heart and improving circulation in the extremities by lowering arterial wall resistance. In some studies, Hawthorn was able to lower resting blood pressure after 10 weeks of use1, however large clinical studies are still needed to confirm Hawthorn’s long-term effect on high blood pressure. Garlic (Allium sativum) has long been used to promote healthy blood pressure, circulation and cholesterol and triglyceride levels, however no scientific proof exists about the acute effects of garlic on high blood pressure2. Potassium has been shown to lower blood pressure in individuals with mild to moderate hypertension3. It even can lower blood pressure in persons who do not respond to blood pressure lowering medications. Magnesium. Research has shown that when magnesium levels are low, blood pressure may be elevated in some patients. Studies suggest that magnesium is effective in lowering blood pressure in patients with mild to moderate hypertension3. 1. Walker, A.F., Marakis, G., Morris, A.P. and Robinson, P.A. (2002) Promising hypotensive effect of hawthorn extract: A randomized double-blind pilot study of mild, essential hypertension. Phytother. Res. 16, 48-54. 2. Capraz, M., Dilek, M. and Akpolat, T. (2007) Garlic, hypertension and patient education. Int. J. Cardiol. 121, 130-131. 3. Geleijnse, J.M., Witteman, J.C.M., Bak, A.A.A, den Breijen, J.H. and Grobbee, D.E. (1994) Reduction in blood pressure with a low sodium, high potassium, high magnesium salt in older subjects with mild to moderate hypertension. BMJ 309, 436. Important: High blood pressure is a serious health condition. Talk to your health care provider first before adding this high blood pressure supplement to your treatment plan. Do not stop taking your prescription blood pressure medications.